Jacqueline Thomas, ND is the clinical director of the Alpine Valley Wellness Center. Her vision of medicine combines the requirement to be appropriately scientific with the need to be compassionately pragmatic. Her commitment to education and prevention stems from her desire to improve our community and our world one individual at a time. Dr. Thomas graduated from Bastyr University in 1995. After finishing her doctorate, she completed advanced training for detoxification, allergy management, and physical medicine at the Center for Optimal Health in Bellevue, WA. She later accepted a clinical residency in primary care and preventive medicine with Dr. Robin Moore in Olympia, WA. During this period her article, Infertility Due to Luteal Phase Defects: Options in Diagnosis, and Treatment With Bio-identical Progesterone, was published in the Journal of Naturopathic Medicine. 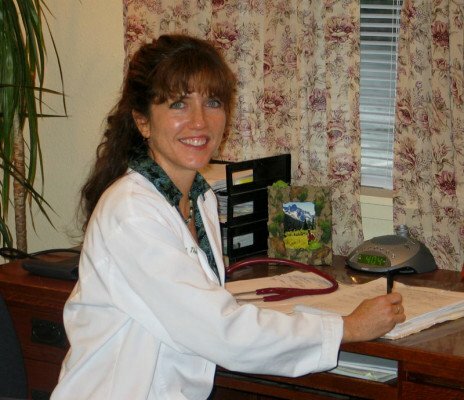 Dr. Thomas is an active member of the American Association of Naturopathic Physicians (AANP), the national organization that supports the naturopathic profession. Dr. Thomas’ involvement with the medical field began at age sixteen, when she started working in local hospitals. She pursued pre-medical studies at the College of William and Mary in Williamsburg, Virginia, where she received a Bachelor of Science degree. Following this, she joined the staff of the Houston Methodist Hospital and became involved in their monoclonal antibody research and organ transplant programs. During this period, Dr. Thomas’ desire to make a contribution on a global level, combined with her dedication to education and improving standards of living in the third world, coalesced into a life-altering decision. She embarked on a two-year tour of duty in Sierra Leone, West Africa with the Peace Corps, where she taught math and science. These experiences solidified the link Dr. Thomas saw between education and empowerment on the one hand, and ignorance and oppression on the other. In healthcare, as in life, she observed that empowering people to make informed choices requires taking the time to help them understand all the available options. Together with her husband, Dr. Gary Piscopo, Dr. Thomas founded the Alpine Valley Natural Health Clinic in 1996. It later evolved into the Alpine Valley Wellness Center, which has grown into one of the most successful integrative clinics in Central Washington. As an educator, Dr. Thomas continuously reviews the medical literature so that she is able to keep her patients abreast of current developments. As a community advocate, she has given numerous public lectures on various health topics. As a primary care physician, her integrative treatments and approach focuses on creating a successful partnership with her patients so that the quality of their lives can be restored and augmented. Each intervention is tailored to the physical, mental, and emotional of each person, based on successful strategies that address the root cause of any given health problem. Dr. Thomas is easily the most hard-working and busiest person at the center. She does the work of a doctor, bookkeeper, practice manager, nurse, lab manager, and entrepreneur, all with dedication and good humor. Her newest passion, however, is being a mom. The experience of having a child fueled her interest in two new areas of service for her patients: pre-conception education and fertility & pregnancy optimization.